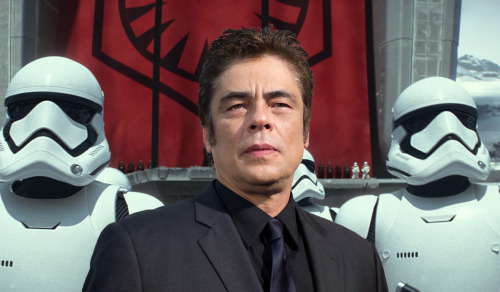 Did Benicio del Toro Rip Off Han Solo Before 'The Last Jedi'? Before Rey stole the Millennium Falcon from Unkar Plutt in The Force Awakens, it was previously stolen by a guy named Ducain, who, according to a new rumor, is being played by Benicio del Toro in The Last Jedi. On Monday, a new rumor was published in the Daily Express claiming that del Toro’s “man in black” will be some sort of Lando-esque space hustler named “Gannis Ducain.” And the second part of that name was immediately familiar to Star Wars fans. Han Solo: Who had it? Ducain? Rey: I stole it. From Unkar Plutt. He stole it from the Irving Boys, who stole it from Ducain. Han Solo: Who stole it from me! Well, you tell him that Han Solo just stole back the Millennium Falcon for good. When Chewie and Han retake the 'Millennium Falcon,' they want answers. If this version of Ducain borrows at all from the non-canon Star Wars book Smuggler’s Run, then del Toro’s character reclaimed the Millennium Falcon between Return of the Jedi and The Force Awakens to settle a debt — before the Irving Boys stole it — so it stands to reason that his potential appearance in The Last Jedi might show him staking a claim to the ship. Other rumors suggest that del Toro’s character will be some sort of mole within the First Order. Making Star Wars speculates that del Toro’s character, named or codenamed “D.J.,” resides on the casino planet of Canto Bight and will assist Finn and Rose in a secret mission. Star Wars: The Last Jedi will be released December 15.